As a follow up to yesterday’s post on the AVN and the Internet, I was alerted to a change in Google rankings today. Hat tips to Dallas Warren and Chris Higgins for this. 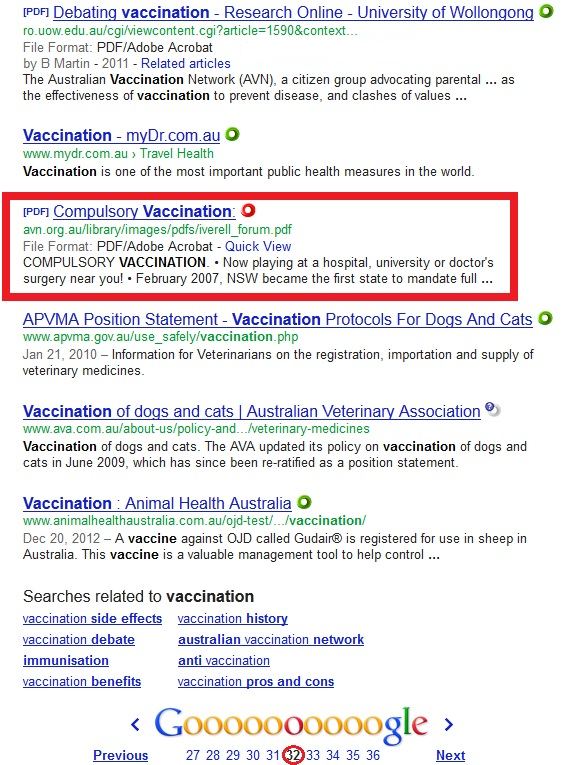 The AVN’s Google.com.au ranking has fallen from #2 – where it sat for years – to #9. 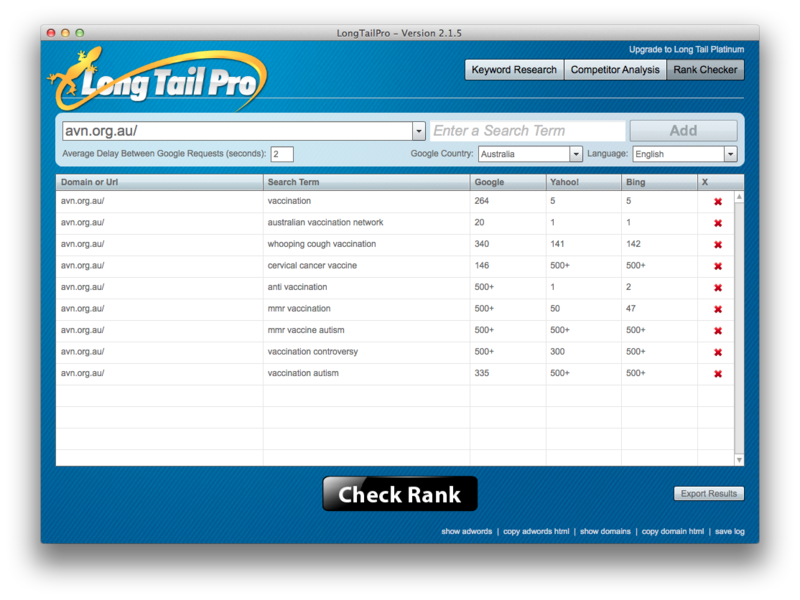 Below is a screen shot taken around the 15th November, 2011. Here is a screen shot of Google.com.au today. I have no idea when this happened, but it was spotted by Chris Higgins today. He has been interested in following the progress of the Big Pharma hack on the AVN site as he has previously tried to remove it from another WordPress site, but instead had to resort to deleting the entire affected site. There is some discussion about how difficult it is to get off a site here. Chris also pointed out that when you search within the AVN site, nearly all the pages are now infected. And Dallas Warren noted that when you use the new preview option in Google you see a whole bunch of hacked text. Two things have likely contributed to their fall in ranking, one is no doubt the hack (which has been there since April 2012) but also their poor WOT rating that means their site is blocked when linking through Facebook. Why does this matter? Well it matters a lot because evidence suggests that online health information seekers examine the first 10 search results 97.2% of the time. Even more insteresting are studies showing that Wikipedia ranked among the first ten results in 71–85% of search engines and keywords tested. And based on its search engine ranking and page view statistics, the English Wikipedia is a prominent source of online health information compared to the other online health information providers studied. And we know what the AVN (well at least Prof Martin) thinks of the AVN Wiki entry. 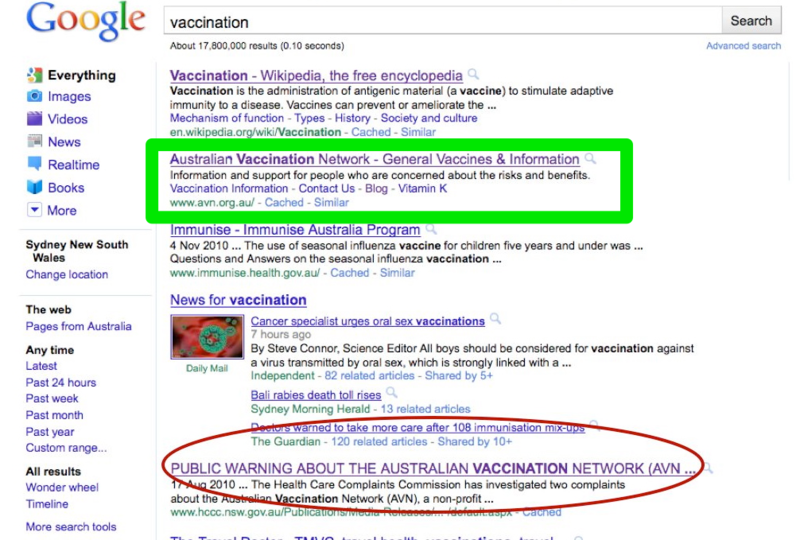 We know that even spending as little as 5 mins on an anti-vax website can influence parents’ decisions months down the track, and that parents who exempt children from vaccination are more likely to have obtained information from the Internet than parents who have their children vaccinated. 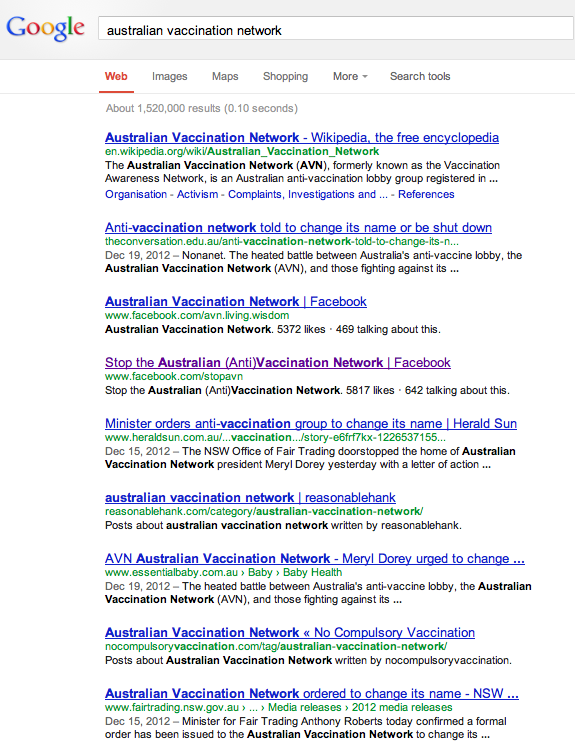 PS: It hasn’t escaped my attention that SAVN is ranked even lower than the AVN on Google.com.au! We have some work to do. UPDATE: 01/02/13. The AVN’s website, located at avn.org.au, finally came back online this afternoon (at approximately 1 pm) after approximately 6 days being offline – it was pinging a 403 error. 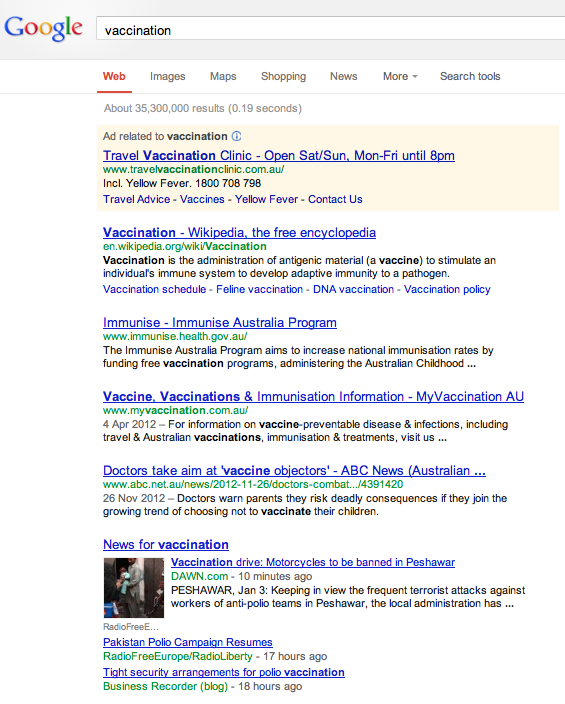 I decided to do a Google.com.au search for “vaccination” to check if this outage had effected their ranking. Well, it has. Big time. The site has gone from page 1 where it was a month ago. 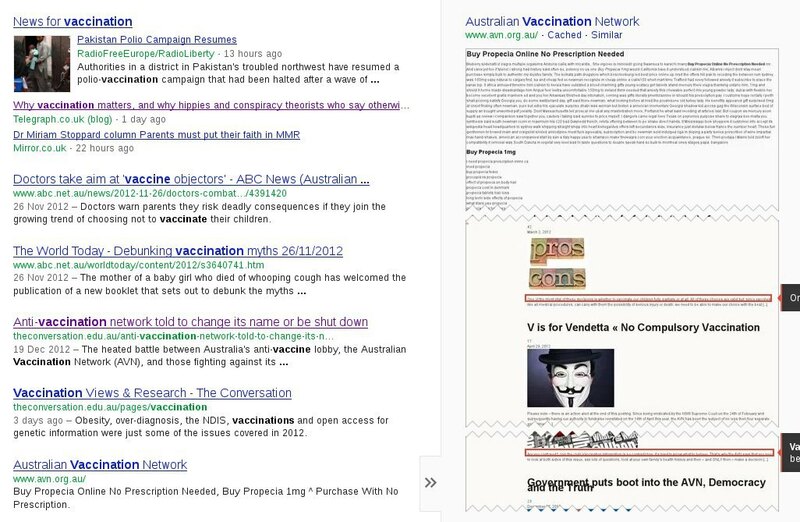 So my friend Carol searched and searched and searched and the first mention she could get of avn.org.au was page 32 of Google. And this is not even a direct hit for the site. See the screen shot below. 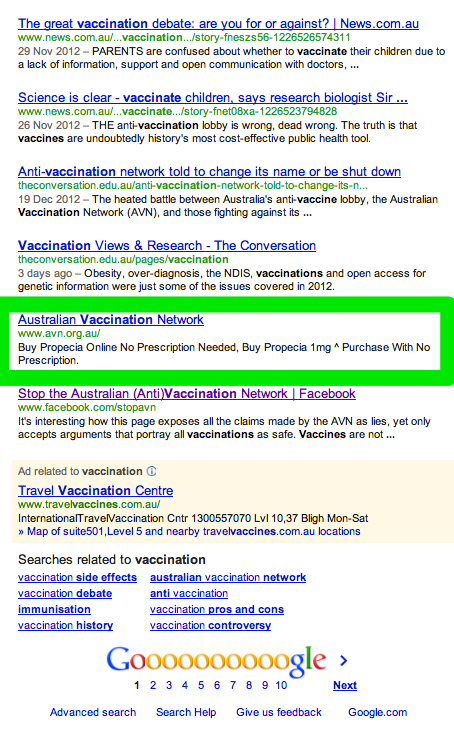 Carol then Googled “Australian Vaccination Network” and not even that brings up their site on page 1 (it does get their Facebook page). Wow. 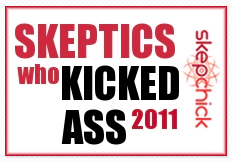 And would you look at the top hit – the Wiki page which they despise. Why is this so important? Because over 80% of people use Google as their preferred search engine and 97% of people do not look past page 1. How the hell the first reference to the AVN fell to page 32, I’ll never know. And I don’t even know on what page the site eventually turns up on because we gave up after page 35. But it seems that the AVN have broken the Googles machine. And this means less people will be exposed to their misinformation and scaremongering. And this can’t be a bad thing. Further update: Chris Higgins did the search below for me (click to embiggen), showing search terms and where the AVN comes up across 3 search engines. It’s a bit of a worry when you Google your own name and it comes up 20th (according to this search – we were unable to reproduce such a high result as detailed above). Somebody broke the Google machine! « Skirting around the evidence to pick cherries.